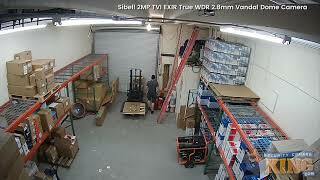 The TVIVD-SBS2IR28 is a 2 megapixel vandal dome from our Sibell series of security products. This HD-TVI camera uses coaxial cable to deliver 1920(H) × 1080 (V) video along with some advanced features to make sure that it will provide high quality video in almost any lighting conditions. The coaxial cable used for this is the same that has been used in analog system for decades, making upgrading an older system much easier and less expensive. This camera also has menu system called an on-screen display or OSD that can be displayed over the camera video and allows you to fine tune the camera's performance to suite the installation environment. The OSD can be used to enable features like 120 dB true WDR, back light compensation, headlight compensation and adjust the intensity of the smart infrared (IR). All of these features help the camera to deal with different lighting conditions effectively. Its ultra-low light capabilities allow the camera to produce color video in minimal lighting by making the most out of ambient lighting in the area. The IR that this camera has represents a technological advancement with the EXIR 2.0. It has improved heat dissipation while actually being more powerful. This new upgraded technology also provides more even coverage across the entire image instead of a concentration at the center of the cameras view. This IR is also configured in such a way that it eliminates IR reflection or bleeding. This camera's sturdy construction also helps it to keep the possible install locations wide open with the IK7 impact rating that protects against criminals damaging it and the IP67 intrusion rating meaning that it’s protected against water and dust intrusion. It can also be installed in temperatures ranging from -40 °F to 140 °F. Its 2.8 mm lens will give you a nice wide shot of about 100 degrees. The purchase of this camera comes with a 2 year warranty, FREE tech support for the life time of the product and free remote viewing software.